Signed and dated lower left corner: Gauffier Florce 1796. Whole-length standing to left leaning against a ruined column, dark blue tail-coat, buff knee-breeches with buff laces, white silk stockings, black slippers with paste buckles, short rattan cane in right hand, left holding yellow leather gloves and black beaver hat with pale blue and crimson lining; long fair wig over fair, nearly white hair, blue eyes, pale complexion, serious expression, aged 20-5. City of Florence in the background. Bought from W. S. Green of 106 Shaftesbury Avenue in 1904 as Henry Vassall Fox, 3rd Baron Holland (1773-1840), appearing as Lord Holland in NPG catalogues until the 1949 edition since when it has been classified as 'Unknown Young Man in Florence'. Holland was certainly in Florence at this time; his portrait by Gauffier, signed and dated: Florce 1794 is still in the Holland collection, half-length seated aged 21 with dark brown hair (Holland House Catalogue, 1904, 122 and Addenda, pp 13-14). Its companion portrait by Gauffier of Lady Holland, then Lady Webster, signed and dated 1795, was also in the Holland collection (ibid., 409 and reproduced Ilchester, The Home of the Hollands, 1937, p 128). 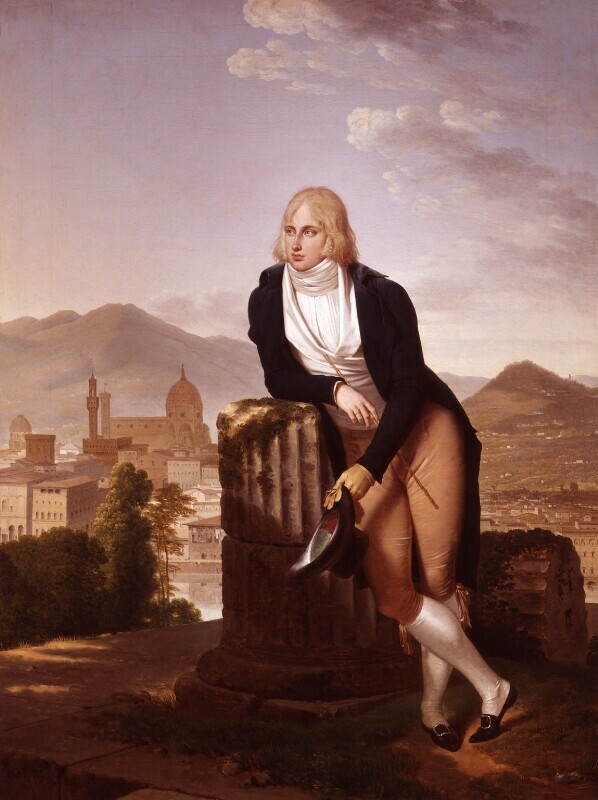 The fair-haired young man in NPG 1382 has not been identified but was presumably one of the many well-to-do Englishmen (possibly Scotsmen or Swedes) dallying in Florence on the Grand Tour and probably a close friend of Louis Gauffier. The same young man appears in another Gauffier picture, 'Vue de Vallambrosa', in Musée Paul Marmottan, Paris, with another version in Musée Fabre, Montpellier. He has not been identified here either.